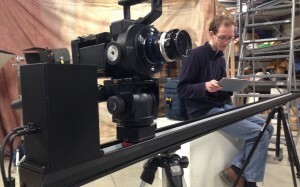 BLC Studios recently purchased an electronically-controlled slider system from a company called DitoGear. A slider is a track which allows the camera to move back and forth smoothly. The 2 meter long unit came with a robotic head which allows a camera to pan and tilt a full 360 degrees with complete precision. The unit is controlled via a small handheld controller, a tablet computer, or the DragonFrame software that students use for stop motion animation. The equipment has a lot of potential across the spectrum of media arts projects. The final music video will be presented during the senior Capstone show on December 12, 2013.